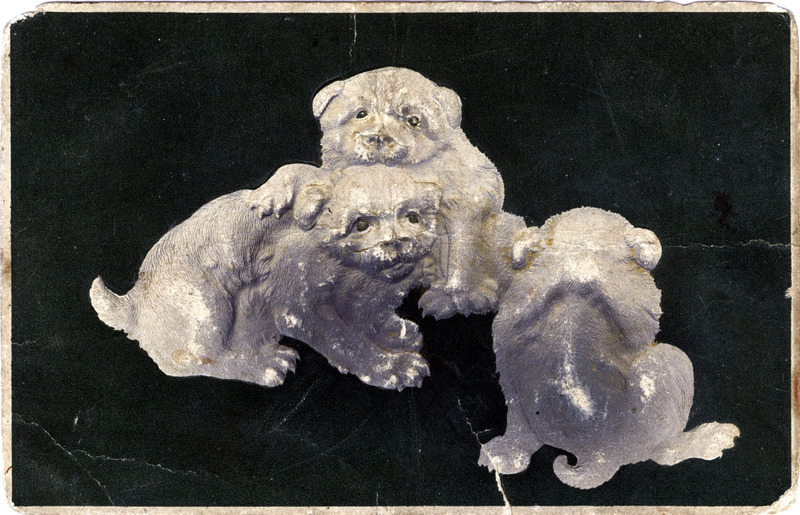 Akita dog puppies, c. 1910. Akita inu puppies, c. 1910. From the wiki: “The Akita is named after the dog breed’s native country, Akita Prefecture, the northernmost area on the island Honshu (Japan). The name, Akita Inu (‘dog’), was not used until September 1931 when the Akita was designated a Natural Monument. Prior to this, they were known as Odate dogs (for a main city of Honshu in the 1800s). “Akitas were originally developed as fighting dogs during the Tokugawa period (1603-1925). Dog fights were as popular in the Far East as they were in Europe and, at that time, the prefecture of Akita was one of the two most popular dog fighting areas (the other being the Tosa breed). At first, the Akita breed was stronger and larger than the Tosa (hence, its nick name Shishi Inu, meaning ‘large dog’). But, gradually, the situation reversed. The Akita gradually lost its popularity as a fighting dog because other breeds, like the Tosa (crossbred with larger European breeds), proved more efficient. The Akitas and Tosas were also cross bred, with the resulting off-spring labeled as ‘Shin Akita’. “Fearing that under the Western influence, traditional and historic landmarks, including animals and plants, would disappear, the Japanese government initiated the ‘Natural Monument’ program in 1919 in order to preserve and/or restore traditional Japanese culture. Preservation of the native Japanese dog breeds was part of that program. The Akita dog was in a state of greatest decline among Japanese dogs, not only in numbers, but also in purity, due to their being crossbred to western dogs (German Shepherd Dog, St. Bernard, Mastiff) and Tosa fighting dogs, mostly during the early part of the twentieth century. Although the natural monument legislation was established by the Japanese government in 1919, almost twelve years went by before the Akita dog was finally declared as a Natural Monument in July 1931. “Several times in recent history, the Akita came close to extinction. A rabies outbreak in 1899 and another rabies epidemic in 1924 resulted in many dogs being destroyed. During World War II, the breed came close again to being extinct because many Akitas, especially those in the cities, were killed for food or for their pelts. The police ordered the capture and confiscation of all dogs other than the German Shepherd dogs, which were used as military dogs. Some fanciers tried to bypass the order by crossbreeding their dogs with German Shepherds. Moreover, due to the food shortage, anyone seen feeding dogs was often considered a traitor.